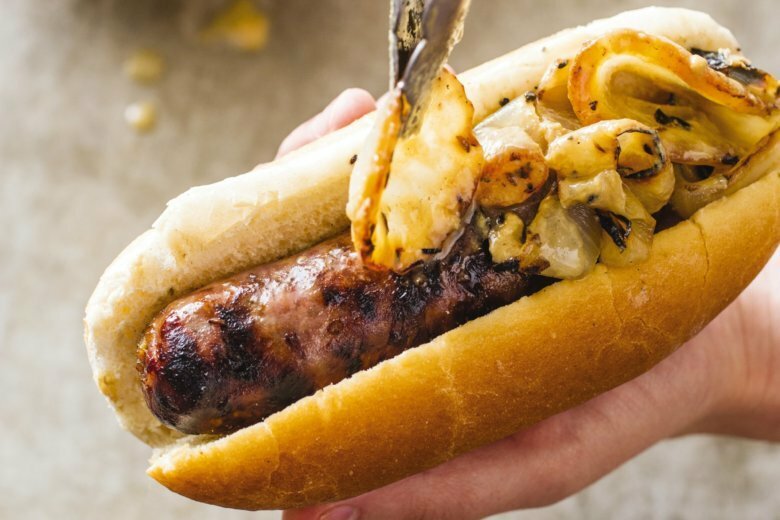 Sausage and onions are a classic pairing that sounds tailor-made for the grill. But the reality is usually onions that are both crunchy and charred and sausages that either dried out or_even worse_catch fire. We wanted a foolproof method for grilling sausages and onions simultaneously that would produce nicely browned links with juicy interiors and tender, caramelized onions. Microwaving the onions_with a little thyme, salt, and pepper_for just 4 minutes jump-started the cooking process and allowed them to finish cooking evenly and thoroughly on the grill. We adapted a ballpark technique, first cooking the meat with the onions away from direct heat in a disposable pan and then finishing the sausages directly over the flames. Keeping the onions cooking on their own in the pan for an extra 5 to 10 minutes allowed the liquid to evaporate and the onions to caramelize to a deep golden brown while the sausages finished up brown and crisp on the grill. Meanwhile, microwave onions, thyme, salt, and pepper in medium bowl, covered, until onions begin to soften and tips turn slightly translucent, 4 to 6 minutes, stirring once halfway through microwaving (be careful of steam). Transfer onions to disposable pan. Place sausages in single layer over onions and wrap pan tightly with aluminum foil. Clean and oil cooking grate. Place disposable pan in center of grill, cover grill, and cook for 15 minutes. Move pan to 1 side of grill and carefully remove foil. Transfer sausages directly to grill and cook (covered if using gas) until golden brown on all sides, 5 to 7 minutes. Transfer sausages to serving platter and tent with foil. Cover grill and continue to cook onions, stirring occasionally, until liquid evaporates and onions begin to brown, 5 to 10 minutes longer. Serve sausages, passing onions separately. Chef’s Note: This recipe will work with any raw, uncooked sausage. Serve the sausages as is or in toasted rolls. Nutrition information per serving: 611 calories; 480 calories from fat; 53 g fat (19 g saturated; 0 g trans fats); 129 mg cholesterol; 1536 mg sodium; 6 g carbohydrate; 1 g fiber; 2 g sugar; 25 g protein.